Add coarse-ground coffee and water to the filter, let it brew overnight, and then remove the filter. Your own perfect cold brew coffee pitcher - every time. Pour it over ice. Heat it up. Use it at home, take it to the office, or take it camping. The large Brew Tube filter gives you a high ratio of coffee grounds to water. The silicone seal allows you to invert the jar during the brewing process ensuring that all of the grounds are completely saturated. BEST COLD BREW FOR COFFEE LOVERS - The original Kolob Brew Tube creates the best coffee or your money back. Read our reviews and buy with confidence! 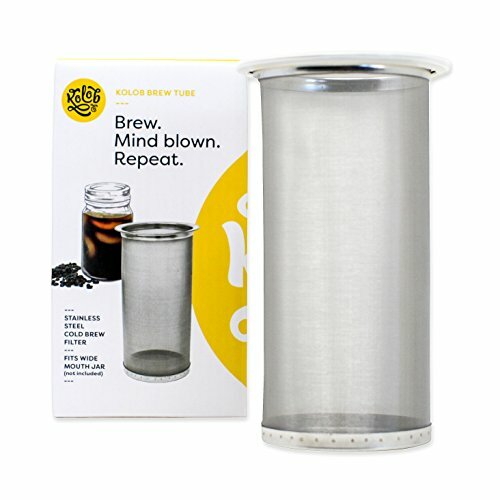 Our ultra fine metal filter is the do-it-yourself, gourmet, organic, manual cold brew system you've been looking for. Drink it iced, black, with milk, half-and-half, soy, as a hot toddy, and more. Fits small 24oz, 32oz (quart) and large 64oz (half gallon / 2 qt) wide-mouth Ball, Kerr or widemouth Golden Harvest canning jars. NO MESS CONCENTRATE - The included simple and easy visual instructions give you a convenient, clean, instant 30-second cold brew preparation method. Just add coarse ground coffee beans and water and let it steep. If you've attempted to strain coldbrew coffee using a cheesecloth, a hemp bag, paper filters, or set up a big, top heavy commercial machines, you know what a mess that is! We give you a bottle of cold brew to simply enjoy without the acid! Coffeemaker simplicity! 100% SATURATION, INEXPENSIVE & AIRTIGHT - The BPA free silicone seal turns your coffee upside down. Invert it. Steep your cold brew inverted so your grounds get 100% immersion and saturation for strong, more concentrated extracted goods. It pays for itself the first time you use it. You spend $5 or more each time you visit your local coffee shop. It makes 4-8 homemade servings of cold brew overnight. Use it for nitro, take it camping, when you travel, or just enjoy a mug in your kitchen. BETTER FLAVOR, SMOOTH, NOT BITTER - The bitterness of drip coffee pot makers is gone. Better than French press, pour-over, and espresso drinks. Taste for yourself the intensely smooth, low acidic hand made flavor. If you prefer ice or hot tea over coffee, we've got you covered! Not only is the Brew Tube the ultimate earth-friendly coffee machine, it's also a botanical tea and fruit infuser, diffuser, and extractor! Add loose-leaf tea and steep! Sun tea infusion at your fingertips! CONVENIENT, ON-THE-GO - You're leaving without your coffee. Options? Yesterday's coffeepot grounds silt, or just hope the coffe gods somehow give you a gift today. A better option? Open your fridge and grab your on demand, portable widemouth tumbler bottle or pitcher full of dark, rich Kolob cold brew. Fast. Convenient. Pro. It's like a diy espresso cofee machine met a wide-mouth maison jar container! And the sieve is dishwasher safe! Are you Keto? This will make the best Ketogenic coffee! If you have any questions about this product by Kolob, contact us by completing and submitting the form below. If you are looking for a specif part number, please include it with your message.